New Book Announcement and Cover Reveal! I am thrilled to announce that my next novel, SHROUDED LOYALTIES, will be released by sci fi publisher Angry Robot in August! It’s about a naval officer who receives dangerous powers when her submarine travels through an alternate realm of existence and is attacked by a monster. She must figure out how to use these powers to save her country from invasion, all the while unaware that her partner is a spy and her brother is an enemy collaborator. In addition to espionage and betrayal, this novel addresses some issues near and dear to my heart, including the gaps that lack of communication drive into our relationships and the temptations that lead us astray in our darkest hours. Through three very different POV’s, I examine subjects such as gender roles in differing societies, the challenges of anger management, and the difficulties of living with self-loathing (this last being a topic I have personal experience with, and drew on extensively as I wrote). 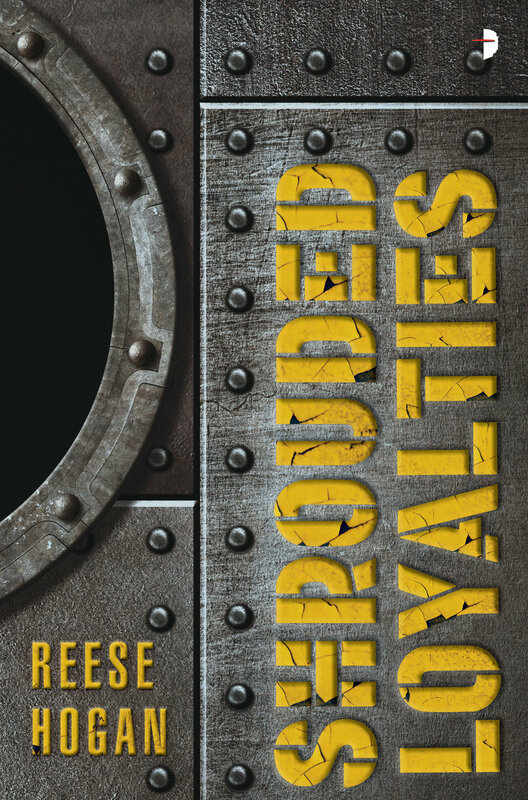 So if you love reading about espionage, submarines, betrayal, alternate realms with mysterious monsters, or relationships that seem broken beyond repair, SHROUDED LOYALTIES might be a great fit for you! And if you prefer having books read to you, I’m excited to say that it’s already been picked up as an audiobook, too! And as a bonus, read an exclusive excerpt from the book on Sci Fi Now! I am excited to finally announce the release of Holding the Ashes! Told in 10 episodes, this post-apocalyptic western is about a thief named Svana who withholds a soul from her death god. Plagued by grief and guilt, and hunted by her loved one’s killer, Svana struggles to save those she can, armed only with the ashes and words in a dead rock star’s journal. Dark and gritty, but with splashes of hope, Holding the Ashes is a journey through grief, memory, and regret, and addresses the ultimate question about whether it’s ever okay to let go. From now through September 1st, I am offering a new-release deal of only $10 for the paperback (plus shipping) if you contact me directly! I’ll send you a signed copy, plus info about other books in the storyverse and Fiction Vortex’s StoryShop app. And if you don’t have my first book yet, 1920’s Soviet thriller The Deadliest Echo, I’ll include that for only $5 until the end of the promotion! As always, I appreciate shares and word of mouth, and am ecstatic to finally share a novel that’s been near and dear to my heart for the past couple years. I hope you love it as much as I do! I am currently working with Fiction Vortex on a storyverse called The White Event. The project is set 200 years after a nuclear apocalypse summoned death gods. The setting has a weird western vibe, with eldritch gods and monsters roaming the earth. My story arc, Holding the Ashes, is about a pensive thief who withholds a soul from the death god who rules over them. As the god fights to take the soul, she must search within the pages of a dead rock star’s journal for a way to save those still surviving. Holding the Ashes will be released in 2018 in a ten-episode format, rotating with the story arcs of three other authors writing in the same world but with different storylines. I am also back at work on my sci fi military trilogy. I’ve been struggling with both the magic system and POV’s on this one, but after completing a complex, 8,000-word outline, I’m diving into a new draft with high hopes it will be my last rewrite. It is set on a secondary world with throwbacks to 1940’s technology. Without giving too much away, it deals heavily with submarines, spies, enemy collaboration, and the harrowing searches for religious truth and personal identity. I am very excited about this one, and hope to have this draft completed over the next few months. Thanks for stopping by! Contact me any time for updates or news, or sign up for my newsletter. Best part? Meeting up with friends I haven’t seen since a year ago and feeling like not a single day has passed. Other best part? Meeting brand new people and realizing within our first conversation that we aren’t strangers at all. The ship—Oasis of the Seas—is huge and overpowering, but this time I’m ready. I’ve got this. A day at the Bahamas! We go to an incredibly hot and muggy botanical garden and zoo, where we walk through a rainforest path and see beautiful parrots and lizards and flamingos and some awesomely huge spiders. Then we sit down for some writing time. I’m stuck on something, and it’s frustrating. But I have some great conversations with a couple writers on the way home, and store the ideas I get. We spend today on the ship. We take a great class on outlining, then watch the Writing Excuses cast (Brandon Sanderson, Mary Robinette Kowal, Dan Wells, and Howard Tayler) record several episodes of the podcast! No spoilers here, but there is some really great stuff coming out in the next few months. Also, two veteran members of the retreat, Miko and Jessica, get married on the ship today, officiated by Mary herself! We are at St. Thomas, in the Virgin Islands. Trever and I, in the interest of saving cab money, decide to try walking to a beach. Our writing friend Steven comes along. We walk through an industrial district we clearly aren’t supposed to be in, then head down a narrow curvy road without sidewalks. It is intermittently rainy, with lush vegetation all around us. We are rewarded; we walk past a hotel and find a virtually empty beach. We jump right in and swim for a while. There is nothing like swimming in the Caribbean—absolutely no shock value of cold when you get in the water. It’s amazing. Later that night, we have dinner at the same table as Brandon Sanderson. I talk to him about some of the things I’ve been struggling with in my book. He has great answers to my questions. We are at St. Maarten. We shop for a little bit, but it is an extremely hot day, and before long, we go back to the ship and swim in the pool. Trever helps me realize I have been trying to start my book in the wrong place. I go back to my room and write 2,800 words. Adding that to my 1,300 of the day before, I have reached 4,100, which is my second-best record in a 24-hour period. I can’t stop smiling. We watch Dan Wells’ film adaptation of I Am Not a Serial Killer. It is pretty good! Then we take an amazing class about Personal Narrative. We participate in a free-writing exercise, something I have never tried. In the course of this exercise, I have an epiphany about things that have challenged me my entire life, and give me new insight about why I am the way I am. In fact, self-discovery has played an unexpected role this whole week. It’s a big part of what makes this trip a life-changing experience for me. At night, we participate in a cosplay, with the theme of sci fi or fantasy weddings. It is my first ever cosplay. Sandra Tayler gives me a prize for her favorite costume. I have to keep the train of my dress from getting stepped on all night, but it is worth it! Today is jam-packed with classes and Q&A sessions. There is another mindblowing class about world building as related to our own ancient history, as well as a really cool one on characterization. I’m exhausted by the end of the day. But I am happy the cruise has been such a success this year—I wouldn’t change a single thing. There’s no other vacation I can say that about. A big thanks to fellow sci fi author Daniel M. Quilter for welcoming me onto his blog today! Quilter asked questions about my writing career, my latest novel, and some of the projects I have in progress right now. Read the full interview here. For a good Christmas movie this season, I’d like to recommend a rendition of my favorite Christmas story of all time—the World War I truce of 1914. The movie is called Merry Christmas, or Joyeux Noel. It’s a spectacular version of a truly amazing event. Just got back from a wonderful week-long writing retreat and cruise with the members of my favorite author podcast, Writing Excuses! It was an absolute whirlwind and I learned SO much and met the most wonderful group of writers and new friends. I hope to be able to attend something like this again in a couple years. Thanks so much to Brandon, Mary, Dan, Howard, and all the guest authors who made this event possible and extraordinary! I had the honor to be featured on a blog today--Caught Between the Pages--where blogger Kayla called The Deadliest Echo "one of the best books I've read so far this year." Thanks for having me, Kayla! Read the full review here. Kayla also featured me on Career Talk Tuesday! Click here to read a little bit about how I came to become an author. Cool off for the summer in Soviet Russia! Pick up The Deadliest Echo on your Kindle or Nook for only 99 cents all summer long! Thanks to Patti Smith for welcoming me as a guest blogger on her website! Read the interview here. Check out the new Recommendations tab on my website to read reviews of some great books I've read! Don't forget about The Deadliest Echo for the sci fi lover or alternate history buff on your xmas list! Only $10 when you buy from me personally, and shipping fee is waived for the holidays! Yesterday's signing at Barnes and Noble was a great success! I got to meet some fun new people and spend time in the beautiful Albuquerque store. I look forward to doing it again sometime! Join me at the Albuquerque Barnes and Noble this Saturday at 2:00 to discuss my recent sci fi thriller, The Deadliest Echo, and pick up a signed copy for yourself or a friend! Congratulations to the winners of the giveaway! The books will be shipped out in the next few days. To those who didn't win, I will still happily sell you a signed copy for no extra charge if you contact me through my website and request one. Thanks to everyone who participated! Happy to say maintenance went quickly...The Deadliest Echo is once again available on iBook for any iOS device. Still also on Kindle and Nook, too! Enter to win a signed paperback copy of The Deadliest Echo through Goodreads! The giveaway ends at midnight on July 31st, 2014. Click here to enter. The Deadliest Echo is currently offline for Ibook, as some issues are being fixed, but should be available again very soon. Please stay posted. Still available through Barnes and Noble and Amazon, either as a paperback or an ebook. The Deadliest Echo is now available in paperback through BN.com and Amazon.com! You can also get a signed copy from the author by sending a request through the contacts form on the website. As a reminder, you can also conveniently download the ebook directly onto your Kindle, Nook, or iOS device.